Sword movements are an important part of Aikido. Studying sword using wooden bokken and shinai, while excellent for learning the motions, is no substitute for the feel of an actual katana (long sword). This is especially true in the study of tameshigiri. The term “art” is sometimes used with tameshigiri as its goal in modern times is to develop the skills of focus and concentration to cut cleanly, and with full control of the sword and body (historically, tameshigiri was the testing of the sword, not the swordsman). Contrast that to using raw strength to hack apart the intended target. Both approaches may be lethal, but one requires the development of the mind along with the body while the other does not. It is the mental component of tameshigiri which makes the pursuit intriguing for us. The katana is used for tameshigiri. It is single-edged and about 40″ long from end to end. 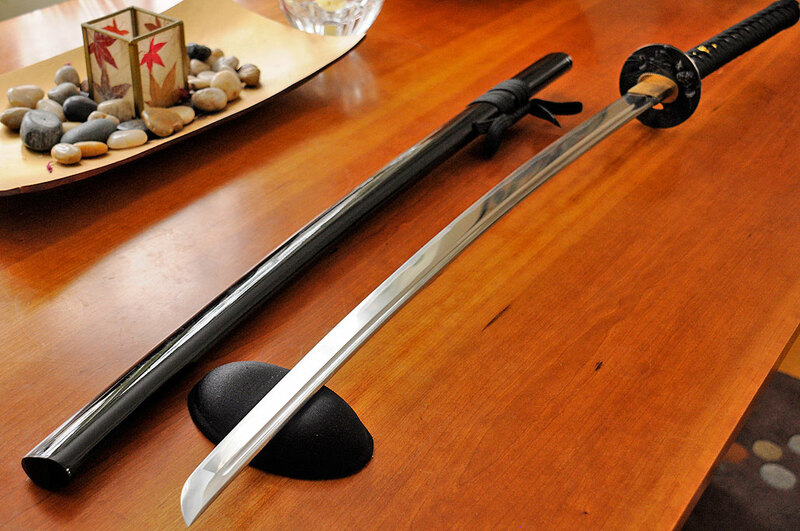 The nagasa (blade) itself is about 28″ from the tsuba (guard) to the kassaki(point). It is sheathed in a lacquered wooden saya (scabbard) fitted specifically for the sword. 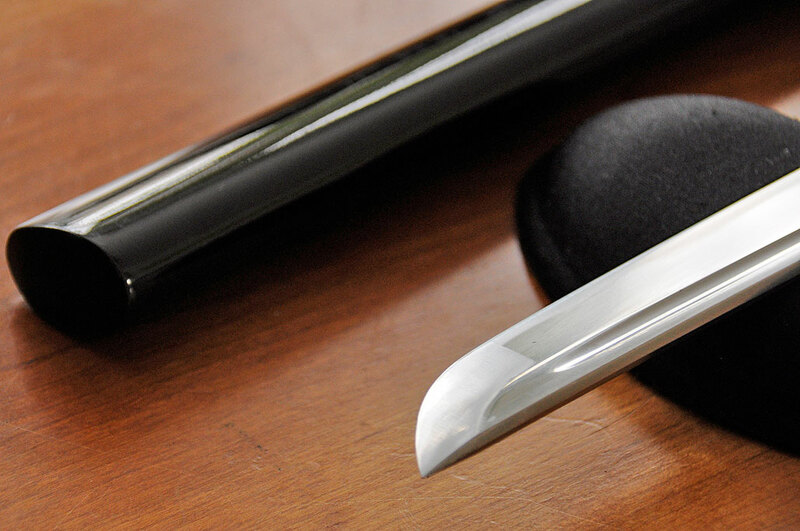 The attention to detail extends to every part of a quality authentic Japanese sword, both in the materials used and the craftsmanship by which the components are made. While the evolution of the katana’s shape and construction was driven by their success on the battle field, individual components, besides being functional, often bear decorations which reflect the skill and artistry of the component’s maker. 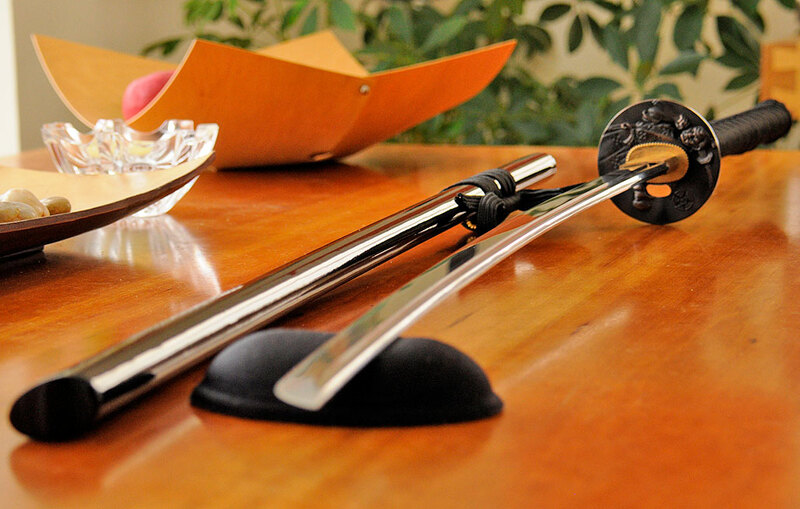 The tsuba on our katana is made of brass and decorated with a different relief on each side. Here is a close up of the fuchi (hilt collar). Note the artwork and detail on its surface. 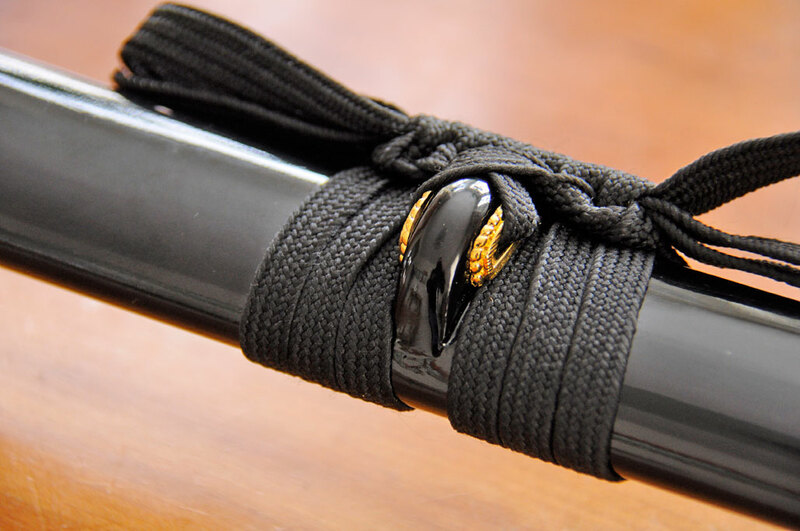 Even the kurigata (cord knob) which holds the sageo (scabbard cord) is decorated. It is not surprising that sword fittings (tsuba, menuki, fuchi, etc), especially antique ones, are highly prized by collectors. The tang of the blade runs the length of the tsuka (handle) and is secured by a mekugi (peg). This peg is typically made of hard bamboo and is inserted through the handle on one side, through the hole in the tang, and out the other side of the handle. The handle is wrapped with same’ (ray skin) and cord. The rough texture of the ray skin helps to prevent the cord wrapping from shifting around the handle during use. In the middle of the handle, under the cord wrap, is the menuki. Like the artwork on the tsuba, the menuki and kashira (pommel) can be quite intricate. The menuki may be the one item on the sword which is purely decorative. There are those who will argue that it offers more grip on the handle, but we find that explanation wanting as they tend to be placed at a location that ends up between the two hands rather than under one of them. The seppa (spacer) and habaki (collar) are made of brass. The collar is shaped such that it wedges the sword securely into the scabbard when worn. Along the length of the back part of the blade is the hi (groove). The removal of metal in the groove will lighten the blade, making it easier to wield without weakening it structurally. Our blade has the balance point about 5″ in front of the tsuba. While this makes it feel “tip heavy,” it also makes cutting with it easier. There is a huge amount of information on blade construction available. Those interested can spend years researching this aspect of the sword alone. A thousand years of war have given the bladesmiths of Japan plenty of opportunities to test their theories. What has evolved is a lethal combination of folded steel and differential tempering. Techniques and materials differ from smith to smith, but folding and tempering impart different qualities to different parts (tip, edge, back, etc) of the blade. It is hard at the edge, strong along its length, and shock-absorbing at the spine. The curve of the blade enables efficient drawing and cutting. While a sharp sword is essential for cutting, it is just one piece of the equation. Form, technique, and concentration are all important components. It is the fusion of all of these pieces which contribute to the success of the actual cut. We will share more of our thoughts on this in a future article. In the next installment of this series, we will show readers how to construct a target stand and to roll the tatami omote mat targets for cutting. Look for it at the start of 2014!